I heard a surprisingly parochial opinion from two left wing oldies on Rachel Pemberton standing for City Ward at the Fremantle council election in October, and it is not one I agree with at all. The husband and wife told me it is totally wrong Rachel is standing for City Ward because she lives in Hamilton Hill. They believe she should represent that suburb. I told them Rachel has mentioned at Q&As I attended how keen she is to move back to Fremantle, but that she can’t afford the high rents in the inner city. That was shrugged off as being irrelevant and that we all have dreams and wishes that are not reality. If we all had the same opinion as this couple, we would only get councillors in Fremantle willing and able to pay close to $ 400.0o a week rent one nowadays has to pay for an average apartment or tiny town house. Passionate Fremantle lovers like Rachel Pemberton have every right to want to represent Fremantle on council, even if they can’t afford at present to live in the city they love. Bad news for boaties around Fremantle with the West Australian newspaper reporting today that the waters between Leighton and Woodman Point will be off limit for leisure craft and commercial boating for 16 days during the ISAF 2011 sailing championships, which will be held off Bathers Beach from December 3 this year. ISAF estimates to have at times up to 850 boats in the water and fear it would be chaos not restricting pleasure and other crafts from entering the area. One of the major problems I have with the Fremantle Gazette is that they rarely report on community events that happen on weekends, while the Fremantle Herald tends to have full page photo spreads. Today however I am very disappointed with the Chook as well, as there is not a word or photo on three rather significant events that happened last weekend. The Fremantle Herald has totally ignored the Hulbert Street Sustainability Festival, which was outstanding, the very good Threads fashion shows in the Town Hall, and the moving memorial service for Aboriginal actor David Ngoombujarra Starr. The Herald report on his tragic death sparked a major uproar in letters to the editor of the paper. The Herald would have had space for a page on last weekend’s events if they had not printed the Who Is Tom Edwards article by David Hutchison. This could easilly have been held back for a later issue and make space for more current events. On a positive note it is good to see the Herald journos are avid readers of this blog, with the two front page articles on Artsource and Bizirkus. I reported on those issues on my blog last week and this week. Reporter Carmelo Amalfi even quotes me from my blog, so all my hard work and commitment to make this Freo’s View blog relevant, interesting and up to date for the Fremantle community is paying off. When one reads the letters to the Fremantle newspapers, listens to discussions in cafes, and goes by comments on Fremantle blogs, one could think we live in a community that really wants to engage in the political process. However the recent turn out to Q&A events shows this not to be the case. Yesterday seven candidates for three contested wards for Fremantle council were willing to be scrutinised at the Town Hall, but just over 30 people turned up, among those councillors Bill Massie and David Coggin and Mayor Brad Pettitt. Earlier this week a FICRA organised Q&A with the three City Ward candidates at the Moore&Moore cafe also only attracted 30 people. When all over the world people fight for democracy, a right given to us in Australia, we show unbelievable apathy when it comes to electing the people who are going to make lifestyle changing decisions for this city. Local councils affect our lives more apparently than other forms of government. Council decisions and laws rule how and if our streets are cleaned, if our neighbours can build monstrosities, if traffic goes this or that way, and if low, medium or high rise is something we desire in Fremantle. Where were all the people who protest on the street against live sheep trade, rail2road, etc. Where were all the passionate, angry, disappointed letter writers, and those who call talk back radio daily. Where were you when asking some questions might have given you a better insight on who to vote for on October 15. Did you try to save your voice so you can speak out loud after the election and complain about the council we have? It’s no use crying over spilt milk when you don’t participate in the local election process. Fremantle Mayor Brad Pettitt posted a comment on this blog yesterday (below the article on Adele Carles) saying the MOU the City might sign with Sirona Capital would not be binding. If it isn’t binding, what is the use of it then? If feels to me as this is a lazy approach to the development of King’s Square, if the council would only deal with one developer, who would partner with controversial builder Luke Saracini. Weren’t we promised outstanding buildings of outstanding creative design and building quality? How will that happen if there is no competition for the developer and builder? What about the financial aspects of it as well. Normally for most jobs over a few thousand dollars City staff need to get three quotes. Are we going to get three quotes from the same developer and another three from the one builder, when it concerns King’s Square? There is a dogmatic haste about development in this city that does not feel right. Take your time to get it right and LISTEN TO US FIRST, not sometime down the track! Decisions, decisions, about what to do in Fremantle this Thursday evening. * Politics are on at the Town Hall at 7 with a Q&A with the council candidates. ** Party time at the Moore&Moore cafe in Henry Street from 4pm till late. It is the staff 70s Dress Up Day and open to everyone. BYO booze! Featuring senior and emerging female artists from the remote Western Australian community of Blackstone. Including new works by Tjayanka Woods, Anmanari Brown, Angilyiya Mitchell, Elaine Lane, Narelle Holland, Jean Lane, Maime Butler, Freda Lane and Janet Forbes. Show will be opened by Dr. Darren Jorgenson, author, art critic and assistant professor of Fine Arts at UWA. A short DVD will be presented that was filmed by the artists at Blackstone especially for the exhibition. TIME TO WALK THE TALK FREO! This Saturday is the start of October and the City of Fremantle still has not released the program for the community consultation period about inner city development. This was first supposed to start in late September and then in early October, but we still don’t know what will be happening and when. It worries me that the consultation period appears to be pushed out further towards summer and the Fremantle Festival in November, when people will want to enjoy the beaches and festival events, which could result in lower residents’ participation in the consultation process than is desirable. It might even go into the ISAF 2011 world sailing championships which are held in Freo in early December, when so much will be going on in town that the media might not have the space or time to scrutinise the consultation process properly. It is now time the City of Fremantle through its Mayor Brad Pettitt released their plans on how, when and where we are going to debate one of the most important issues for Fremantle for many years. More delays would put into question the seriousness of the council’s claim it wants community input, and are not acceptable. The ECCO pizzeria in Market Street, Fremantle has gone the same way as their award winning Subiaco restaurant and closed its doors. They always looked as if they were struggling, even when the restaurants next to it were full Ecco looked empty. It is a shame as I quite liked the pizzas there and we had a few photographers lunch meetings there in the past. 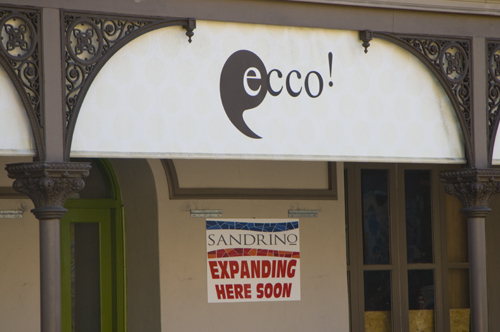 SANDRINO next door is extending its restaurant by taking over the Ecco space. The food critic of the West Australian, Rob Broadfield, wrote some months ago that Sandrino makes the best pizza in Perth, so that is a big wrap. Good luck to them! It was such a cold, wet and windy spring day yesterday, that I almost contemplated migrating back to Holland. But hey, a bit of freezing is a good price to pay for living in glorious Fremantle, so out came the thermal underwear. 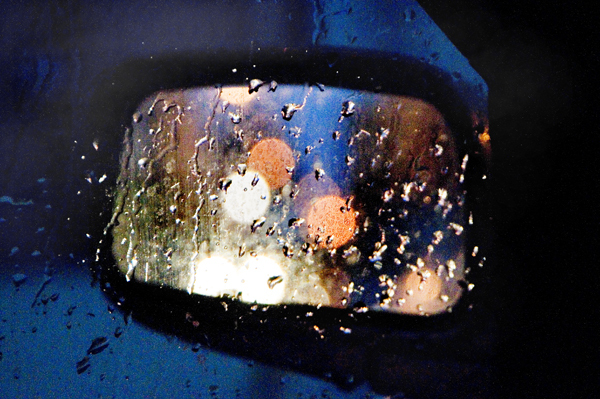 Rain was pelting down when I arrived, so I took this arty shot of the car mirror while waiting for it to subside. Jonathon Barrett in the Financial Review reports that independent Fremantle MP Adele Carles has attacked the City of Fremantle for wanting to sign a Memorandum of Understanding (MOU) with Sirona Capital on the future $ 80 million King’s Square development. It is understood Sirona intends to use Luke Saraceni, the former owner of the Myer building, before it was purchased by Sirona Capital, as the developer of the city square. Saraceni has been in serious financial trouble and had huge problems with the Raine Square development in Perth, which were widely reported in the media. Saraceni said to the Financial Review that they will go ahead with the development of the Myer site, no matter what the council intends to do with King’s Square. Fremantle Council this evening was going to put the proposed MOU to the vote, but it now appears this will be delayed for two weeks. One wonders why it can’t wait till the new councillors are on board after the October 15 election. Why is the council in such a hurry. It seems to want to rush things through without taking time to consider all pros and cons, as Michael Swanepoel, candidate for City Ward, pointed out last night at the candidates forum. Please relax Brad, Josh, Andrew! Rome wasn’t built in a day, and getting it right is better than doing it now!